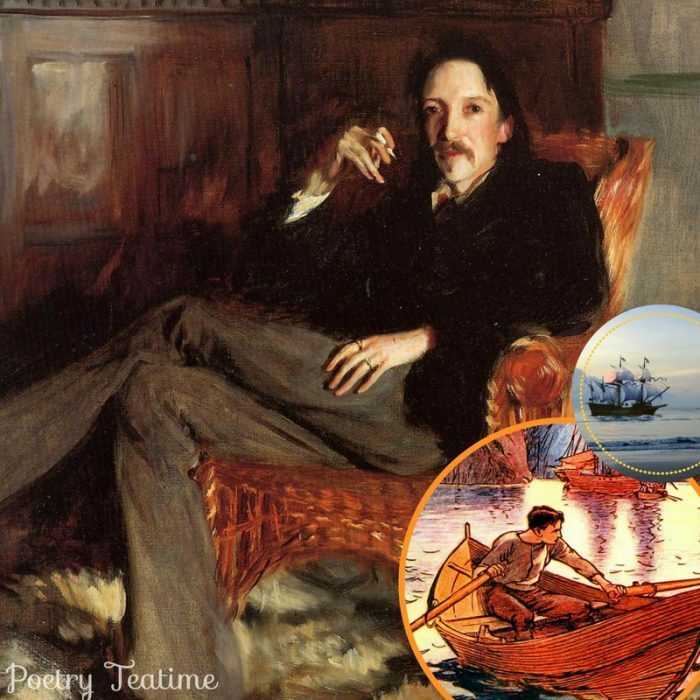 Today’s Poetry Teatime celebrates the adventurous life of Robert Louis Stevenson! You may know Stevenson by his classic adventure stories like Kidnapped and Treasure Island, which feature plenty of pirates and buried treasure. But he was also a wonderful poet whose poems stir the imagination and tickle the senses. Let’s explore Stevenson’s poetry together! Robert Louis Stevenson was born on November 13, 1850 in Edinburgh, Scotland. He came from a family of engineers, and his father and grandfather were responsible for the construction of most of Scotland’s lighthouses. While Stevenson began university as an engineer, he eventually decided to travel the world and write. After that, he had a long and illustrious career writing adventure stories, poetry, and songs. Stevenson traveled a lot in his life. In fact, he traveled so much that he invented a prototype of a modern-day sleeping bag! Although he wasn’t a pirate himself, he did have a criminal conviction—for throwing snowballs during his days as a student. He died while on the island of Samoa and was honored by Samoans as the Teller of Tales and buried on top of a mountain on the island. Stevenson has such a wonderful knack for capturing the feelings of each season. He also describes the enjoyment of a beautiful song in the following lines. Poetry has such power to linger in the imagination! We’ve collected a few activities, resources, and poetry collections below to help you make the most of Stevenson’s poetry in your teatime. In the Footsteps of Robert Louis Stevenson: Trace Stevenson’s journeys around the globe and take a look at the places that inspired some of his most famous works! Art and Stevenson: Check out this collection of poems and coloring page illustrations of Stevenson’s work compiled by Amy’s Wandering! Also, take a look at this printable booklet from Wildflower Ramblings, which pairs Stevenson’s poetry with Impressionist paintings.